Paid Search (also known as Pay-Per-Click or PPC), using Google Adwords is a fast, effective way to advertise to people who are already searching for your products or services. We can control where your ads appear, when they appear, what they say, and how much it will cost you. Google Adwords “Pay-Per-Click” does exactly what it says – placing your advert at the very top of the first page of Google won’t cost you a penny, because you only pay for the actual visitors to your website. We then “bid” on these keywords, and Google will ascertain the “rank” in the paid search listings, based on factors such as bid amount, quality score, click-through-rate, etc. Many people are confused by the difference between Paid Search (PPC) and Search Engine Optimization (SEO). 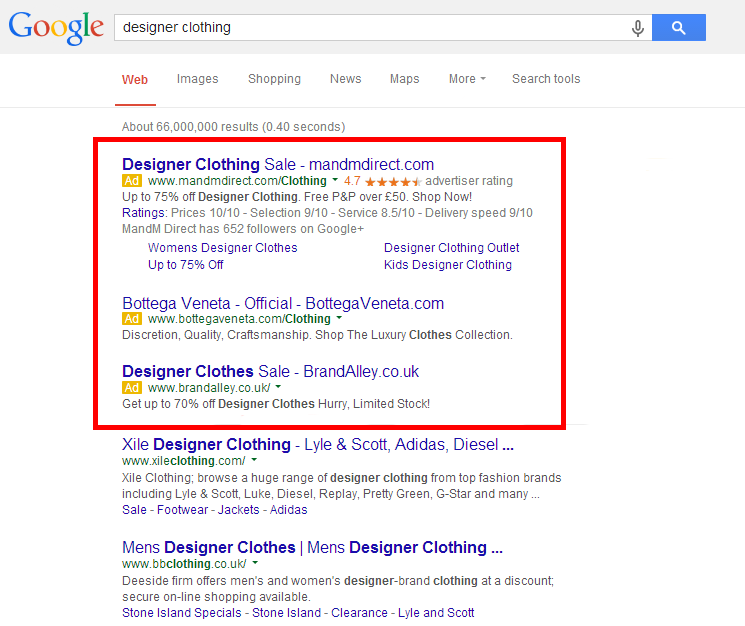 In simple terms, PPC adverts are shown at the top of Google, as demonstrated in the screenshot here. 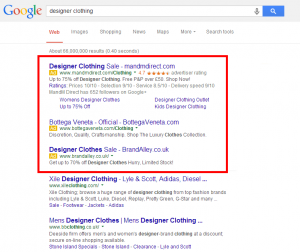 SEO or “organic” results appear below the Paid Adverts. Our consultants are experts in exploiting the algorithm used by Google, in order to achieve the highest possible position without having to spend too much. Did you know that with the right knowledge and tools you can actually achieve a higher position on the page than your competitors for less money? When someone searches for one of your keywords and you advert appears on their screen, this is known as an “impression”. Impressions don’t cost you anything! However, if they like what they have seen in your ad and decide they want to visit your website by clicking on the ad, that is a “click” and that is when you pay Google. Hence the expression “pay-per-click”! As you can see, this is a very powerful and cost-effective way to generate sales or business leads, as the visitors you are paying for are already looking for what you’re selling!